Explore, Plan and Navigate your boating trips in real time and outstanding high-resolution with the latest NOAA Marine charts covering the whole of the USA and US Great Lakes. - Route Planning and tracking with Waypoints, ETA, XTE, etc. 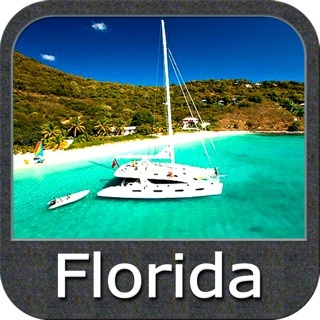 SeaNav is a Universal app, which works on iPad, iPhone and iPod. SeaNav uses Digital Vector charts providing a wealth of benefits and advantages. Buoys, Lights, Bridges, Depth Contours, Depth Soundings, Rocks, Anchorage areas, NOAA Weather Buoys etc. are all selectable and have real time distance, bearing and detail information. Turn off layers to de-clutter the display and only show what is important at the time. Tides, moon and sun times and weather are also all available at your fingertips. SeaNav’s unique AR view mode allows you to view buoys, lights, ships, waypoints and track overlaid on your iPhone or iPad live camera view. With "AR LockOn" you can select a target on the chart and then be guided to it in the AR camera view. 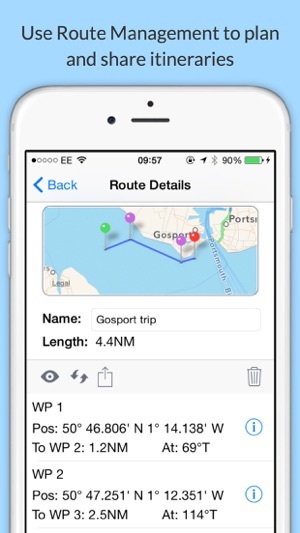 SeaNav lets you measure distances and bearings and record waypoints on routes. 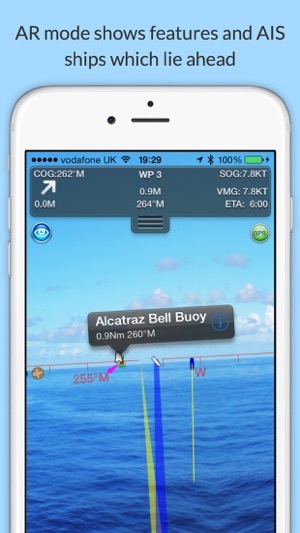 When at sea, the app’s Sailing HUD shows your position, Course over ground (COG), Speed over ground (SOG), Vector Made Good (VMG), Estimated Time of Arrival (ETA), Distance and bearing to next Waypoint. Waypoint reached alerts, auto-routing to the next waypoint and collision alerts. SeaNav has free Apple Watch and Pebble Smartwatch apps available. 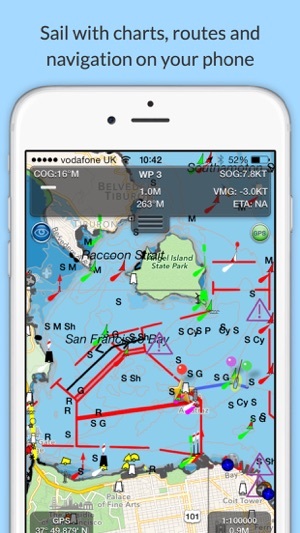 Lowrance, Simrad and B&G GoFree support included. Your purchase of SeaNav includes 12 months of free updates to the included US chart set. Further chart updates are then available via an in-app purchase. Charts for other regions including Canada may also be added to your product via optional in-app purchase. Our in-app purchases are 1 year subscriptions, which automatically renew at the end of the subscription period unless auto-renew is turned off at least 24-hours before the end of the current period. Payment will be charged to your iTunes Account at confirmation of purchase, and will be charged for renewal within 24-hours prior to the end of the current period. Pricing for our 1 year US Charts update subscription is US$9.99. Subscriptions may be managed by the iTunes account holder and auto-renewal may be turned off by going to Account Settings after purchase. Requires iPhone or iPad. GPS only required for real time route navigation. Optional Real time AIS, Tides and Weather information require an active internet connection. Real-time route navigation requires a GPS location. iPhone devices and iPads with a cellular modem already have a built-in GPS, even if they do not have an active service plan. If you have a WiFi-only iPad or iPod you will need an external GPS receiver to enable navigation. Inexpensive 3rd Party units are available to add these accurate location capabilities to your device via bluetooth. This program is distributed in the hope that it will be useful. SeaNav should only be used for basic navigation reference and should not be solely relied upon to determine precise locations, proximity, distance, or direction. NOTICE: US Marine Charts are derived from official NOAA Electronic Navigational Charts. Collision detection Time to Collision and Distance collision guards can now be changed from the default of 200m in 10 minutes to any distance and time and can also be disabled by setting CPA Time to 0 - See Boat Details in SeaNav Settings..
POI Manage/Add new POI bug fix. Purchased app yesterday and initially worked perfectly, then my iPad wouldn't show position on SeaNAv. Strange. I emailed Steve Bennett @ Pocket Electric (the developer) and I had an email back from him this morning. There's a known bug in the llatest bersion of iOS software that prevents the iPad from accepting location from the extenral GPS (in my case, a Dual). The fix is on the iPad: (1) turn off location services on iPad; (2) reboot iPad; (3) wait 5 seconds and turn iPad on; (4) turn location services on. This may need to be done whenever the problem reappears. Let's hope Apple fixes this soon. 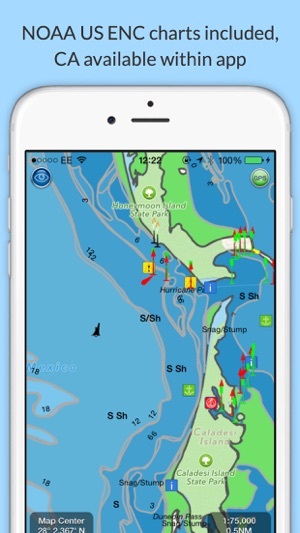 Anyway, the SeaNav app is outstanding and a real bargain for the recreational boater, in my opinion. And the quick, accurate and friendly tech support seals the deal for me! Works best on iPad 3 with cellular/wifi as this iPad 3G has a GPS assisted capability whether connected or not to a cellular network. IPad 2 wifi (no cellular) dees NOT have a GPS Satellite Receiver in them so you would need to add a GPS receiver to an iPad 2. I tried using a Verizon Hot Spot Cellular with iPad 2 and neither worked, nor did Apple Maps or Google Maps. There are no cellular towers in the middle of Lake Michigan, so the triangulated cellular cannot function on a iPad 2. You end up sliding along the shoreline and never go out into the Lake. The same problem happens with Apple Maps and Google on an iPad 2 with wifi. 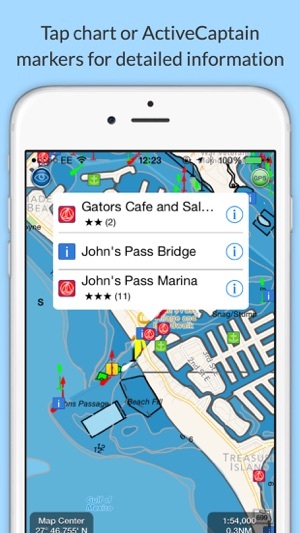 Apple Tech Support acknowledges that they are having problems with Apple Maps and today acknowledged issues reported with SeaNav and BoatBeacon, both sold through their AppStore because of the lack of a GPS receiver in the iPad. App is suppose to cover all US charts yet none of the lakes in my area show up. In fact, none of the lakes in my state show up, and we are talking some rather large bodies of water. The only body of water to show up is a floodplain called little blue river which isn't even navigable, lol. App should correctly read only select US bodies of water, not ALL U.S. charts. Waste of $10. Navionics is much more complete.